Be the first to review this 2019 Ford Mustang. The 2019 Ford Mustang is the best Mustang ever built. It won’t be remembered like the 1965, and it’s not even the first year of a new generation, but there’s none better. It’s faster than ever, rides better than ever, and handles better than ever. It charges hard and corners flat, at least with the right package. Passenger - carrying isn’t the best, but that’s par for the course. It’s a sports car - and for its performance, it’s a bargain. The Mustang was redesigned in 2015, and last year it got tweaks to its face, including standard LED headlamps, a more pouty mouth, and lowered nose. It might be argued that 2018 was just as good, because there are no mechanical changes for 2019, except for ... drum roll ... the return of the Bullitt, a 480-hp near-identical clone of the Mustang GT. For 2019, Ford makes active exhaust standard equipment, and bundles a new 1,000-watt audio system with some models. Also, every model now has optional forward-collision warnings with automatic emergency braking, which not all rivals offer. The Mustang comes as a coupe called Fastback or convertible called Convertible, the V-8 GT, the Bullitt, and the ultimate prancing pony, the track-ready Shelby GT350. The base engine is a 2.3-liter turbocharged 4-cylinder. If you’re worried about a 4-cylinder Mustang, don’t. Its 310 horsepower and 350 pound-feet of torque will squash any early V-8 Mustang made. It doesn’t have the deep rumbling exhaust note, but that’s what the GT is for. The former V-6 engine is gone. Turbo-4s are today, period. The Mustang with the turbo-4 accelerates from zero to 60 mph in less than six seconds, shifting with a great 6-speed manual or a fine 10-speed automatic. Standard equipment includes something called Line Lock, which enables burnouts at the touch of a button and a drop of the hammer. Line Lock is easily the most lunatic and necessary standard feature of any 2019 model-year vehicle. If that isn’t enough to make it pure, fine. The GT carries a 460-horsepower, 5.0-liter, double-overhead-cam V-8 under its long hood, and makes itself known with an active exhaust system. Fit with available adaptive dampers, it can handle with almost anything on the road. The Ecoboost is EPA-rated at 21 mpg city, 32 highway, 25 combined, with the 10-speed automatic transmission, and 1 less mpg with the 6-speed manual. The heavier convertible gets 2 less mpg. Premium fuel is required, wiping out the economy of 25 mpg. The GT with the automatic gets 16/25/19 mpg and 18 mpg with the 6-speed. The Shelby GT350 gets 16 mpg. As for crashworthiness, especially important in a car like this, the NHTSA gives the Mustang five stars overall, with five stars in every test. Some cars get five stars even with one or two four-star ratings in specific tests, so there should be a should be five stars with an asterisk for those lesser five-star cars. The IIHS is tougher. They rate the Mustang’s small-overlap protection (trees and telephone poles) only be Acceptable. All Mustangs have LED headlamps and a knee airbag for the driver. Other optional safety equipment includes blind-spot monitors, adaptive cruise control, and active lane control. Ford sells the Mustang in base, GT, Bullitt, and Shelby GT350 trims, with choices of body styles (Fastback or Convertible) and transmissions. The base coupe is $26,120 before destination, while the convertible costs $5,500 more. Standard equipment includes power features, LED headlights, 6-speed manual transmission, keyless ignition, and a six-speaker audio system with Bluetooth audio streaming. And don’t forget it’s burnout-ready with Line Lock. The GT for $35,355 gets the 460-horsepower V-8, plus 18-inch wheels, power front seats, and rear parking sensors. For both the turbo-4 and GT there’s a Premium model that adds $5,000 and $4,000 to the price, respectively. The Premium includes leather upholstery, an infotainment system with Apple CarPlay and Android Auto compatibility as well as an 8.0-inch touchscreen, dual-zone automatic climate control, and heated and cooled front seats. A B&O Play audio system has 1,000 watts of sound plus integrated Waze and Alexa services. The Premium has an available package including a digital instrument pack that brings with it navigation, color-keyed door trim, better upholstery, remote start, in-car WiFi, and a heated steering wheel. Then there is the Performance package, with stiffer suspension tuning, grippier tires on bigger wheels, a better rear differential, and Brembo six-piston front brakes. From there, the GT can add a Performance Package Level 2 with even stiffer tuning that works in beautiful concert with an optional adaptive suspension, and an active exhaust system that delivers a menacing roar or a soft around-town sound. When the nose was lowered and mouth reshaped last year (into a bit of a frown), it made the Mustang’s connection to the road tighter. The LED headlamps make it look serious. In profile, the long hood, fastback roof, and muscular haunches make it look more handsome than ever before. The C-shaped taillamps work at the rear, but the available spoiler with the Performance package doesn’t; it looks like an aftermarket piece. There are many packages that dress the Mustang up or down, with more chrome or less, bigger or blacker wheels, and gaudy attention-seeking stripes. 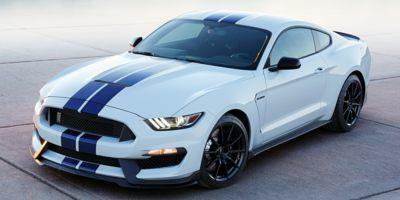 We’ll stick to the iconic thick double blue stripes on a white car, like the original Shelby GT350. The dashboard tries to look retro but isn’t quite as convincing as the sheet metal. But the optional digital gauges bring some drama to the dashboard. And available packages replace the hard plastic with better trim, from carbon fiber to contrast-stitched leather piped in red or blue. The best-looking trim, which actually does fit the Mustang’s character, is brushed metal, and it doesn’t cost extra. The cloth front seats in the base cars have decent support, adjustable in four directions. The Premium models have power-adjustable leather seats with plush padding that provides a luxury feel. The available sporty Recaros are so firm and snug you can save them for race days. There’s good headroom and legroom in front, and the tilting adjustable steering wheel helps too. The rear is small even for small people, although it’s more spacious than the back seat in the Camaro. The Convertible back seat is even smaller than the Fastback. The Fastback has a decent 13.5 cubic feet of trunk space, enough room for a road trip. The Convertible has just 11.4 cubic feet, so make it a shorter trip. Outward vision is okay, but the surprise comes in rearward vision, which is actually decent, and we don’t mean in a Convertible with the top down, we actually mean through the Fastback glass. Although it hardly matters because it’s better with the standard rearview camera. All you have to do is look at the torque numbers of the turbo-4 engine to see what it can do. Never in the old V-8’s wildest dreams did it imagine pounding out 350 pound-feet of torque at just 3000 rpm. That means you can be loafing along in a higher gear, floor the throttle, and take off like a rocket. The 10-speed automatic won’t need to shift down too many gears; or if it’s the 6-speed manual transmission, you probably won’t need to downshift at all. You can pass without thinking ahead. You can pop into holes on the freeway. The throttle response is nimble. And while we’ve acknowledged that the turbo-4 doesn’t rumble like a V-8, it does have a certain throaty sound, setting itself off from your average tame normally aspirated 4-cylinder making half the horsepower. The 10-speed automatic’s shifts are crisp and predictable, whether in Sport or Normal mode. The transmission works better with the turbo engine than with the V-8 in the GT. The handling on a stock coupe is excellent. With standard wheels and tires, the electric power steering is precise, with good weight programmed into the steering wheel. Without the stiffening provided by the optional Performance package, it can bound over bumps and wiggle in esses. If it were our Mustang, we would go one step farther, to the magnetic adaptive dampers, which mute the small quick hits of patchy pavement. In Sport mode, the rear end is totally stable, so the cornering is flat and sharp. The Mustang GT brings a visceral muscle-car thrill, with its 5.0-liter V-8 making 460 horsepower and 420 pound-feet of torque. With its rev-matched 6-speed manual transmission, it feels fluid and fantastic. It can blast from zero to 60 mph in 3.9 seconds; back in the day of the original Mustang, that was the 0-60 mph record, set by the AC Cobra that used the Mustang’s 289 cubic-inch (4.7-liter) Ford V-8 engine, borrowed by Carroll Shelby for the Cobra. The connections run deep. The 10-speed automatic that works well in the turbo-4 isn’t as comfortable with all that horsepower in the V-8. It often takes a pause before it decides on a gear. We’d stick with the manual, but most won’t. The 6-speed manual gearbox is the way to go, with the GT. It’s old-school that matches the exhaust noteΓÇöwhich, by the way, can be toned down in your neighborhood. As for the stunning Ford Shelby GT350 Mustang, its flat-plane-crank 5.2-liter V-8 makes astonishing power, and its magnetically damped suspension provides racetrack handling. The ride is brittle on everyday pavement, but Ford never said it was supposed to be a gentleman’s coupe. The latest Mustang is the best yet. The powertrain’s a rave, and so are the body and the handling. It’s not very spacious in back or in the trunk, but with a manual shifter and a big V-8, it brings the thrills of musclecars past vividly into the present. 2019 Ford listings within 25 miles of your ZIP code. Find 2019 Ford listings for sale near you. Get a free insurance quote provided by GEICO and save 15% or more. * The J.D. Power Ratings are calculated based on the range between the car manufacturer or car model with the highest score and the car manufacturer or car model with the lowest score. J.D. Power generates a rating of a five, four, three, or two. If there is insufficient data to calculate a rating, “Not Available” is used in its place. J.D. Power Ratings may not include all information used to determine J.D. Power awards, visit the Car Ratings page to learn more about awards and ratings.